The present invention relates to a system and method for reducing risk to a firm and firm program and, more particularly, to reducing risk and improving yield or performance by considering firm strategic intent, phase, and integrated visuals. The current invention identifies, quantifies, and integrates strategic intent into the risk mitigation procedure by modifying the consequence chart, by dividing the program into phases, and by depicting risk related metrics, including strategic intent, that are associated with the risk element, the program, and/or the firm in a three dimensional graph. This IP can be used for software firms (proposes a unique three dimensional graphing method useful for CAD or Math type software). This IP is very useful for Investment banking or other financial institutions that want to look at the risk vs. return of disparate projects (comparing apples to oranges). This IP is very useful to engineering trade studies and software for systems engineering as it helps rationalize and normalize competing projects and decisions based on risk and phase of the project. 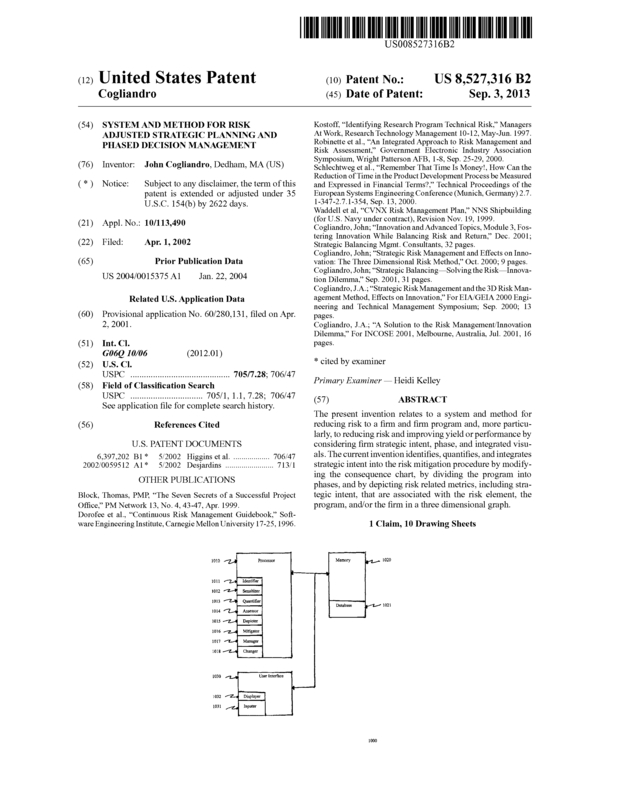 Page created at 2019-04-21 18:13:15, Patent Auction Time.